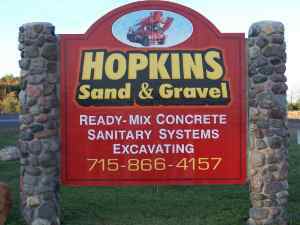 Hopkins Sand & Gravel is a family owned business, founded in 1946 in Webster, Wisconsin. 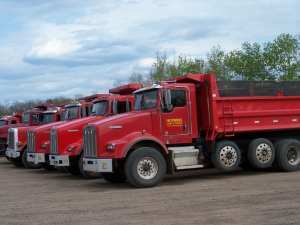 We have built a rock sold reputation in northwestern Wisconsin and northeastern Minnesota by providing our customers with quality products and services. 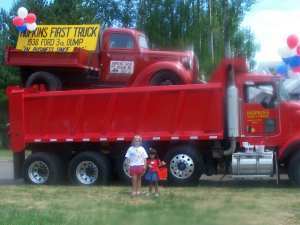 Our great team of drivers and operators are here to help you get the job done right the first time. Please contact us for your sand, gravel, excavation, septic, or ready-mix concrete needs. In 2017 we had a local company bring multiple loads of rock out to our house who did a poor job of spreading it as promised. In 2018, we called Hopkins and asked to have them look at it to see what it would take to fix the mess we had. Todd came out and gave us a bid on bringing in the right amount of rock and promised they wouldn't leave until we were happy with the job. Not only did they show up when they scheduled but the skid steer operator was even more meticulous than we expected. From our initial call to get a bid to our last call to pay the bill, each person we encountered was professional and courteous. Hopkins gets it right on all levels and we won't hesitate to contact them in the future as need.